Pirate Ace finds a place better than the usual crow's nest from which to observe last year's Fall Great Plains Renaissance Festival. 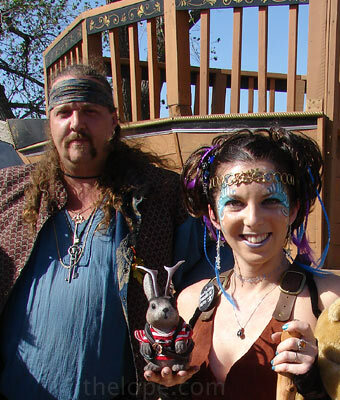 His kindly provider is a woman who calls herself Vixen Sparrow. 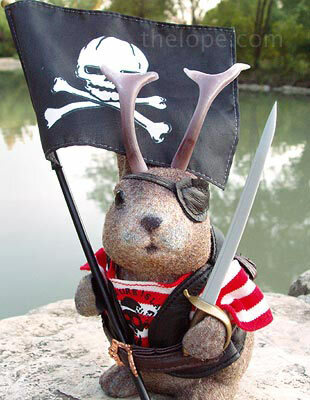 Because it's obviously such an important holiday, we at thelope have been celebrating International Talk Like a Pirate Day every September 19 for three years by gathering pirate pictures for just this date. Check out last year's post, in which I went off on a tangent about Sir Francis Drake and his Golden Hind (er...it's his ship). Also see 2006's Avast Me Beauties in which we touch on Treasure Island, Peter Pan, the Pittsburgh Pirates and the origin of "arrr!" We also show a picture from inside Disneyland's Pirates of the Caribbean ride before they added Pirates of the Caribbean movie animatronics to it. 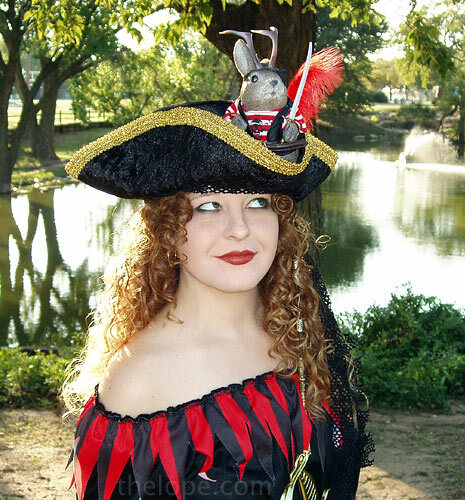 Rayne the pirate girl has been a popular regular presence on this site, so here's a previously unpublished shot of her. Of course, I keep my spyglass out for pirates all year, and a few have come over my horizon since last September 19. 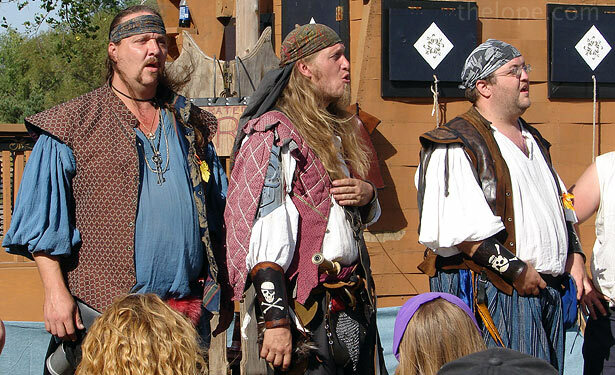 The aforementioned renaissance festival always offers pirate imagery. There is usually a pirate ship/stage. 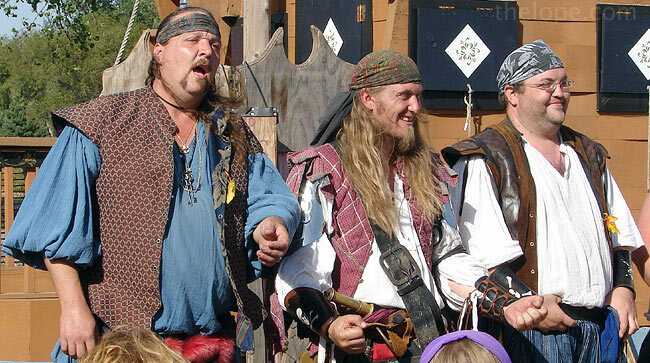 This group was doing a rather ribald pirate dating game. 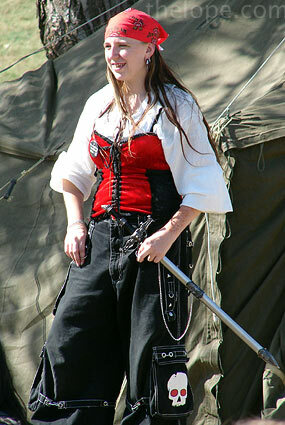 At least two of these belly dancers were exhibiting piratical dress. 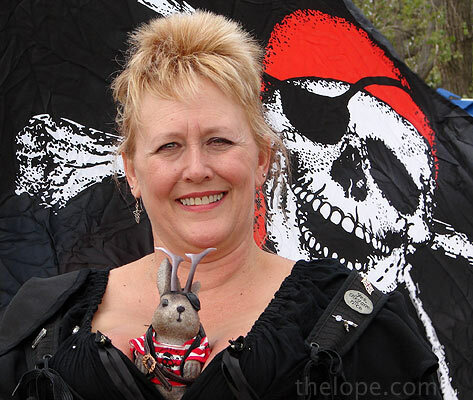 I do believe a home should be established for women who think they're pirate wenches. I volunteer to monitor their progress. 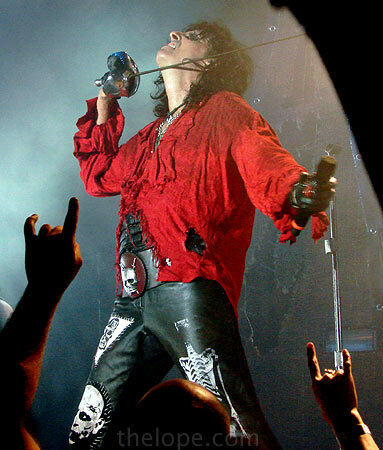 Variations of the Jolly Roger were common. 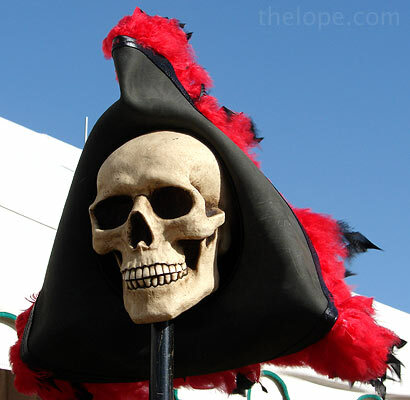 Pirates, you know, have an excellent sense of decor. 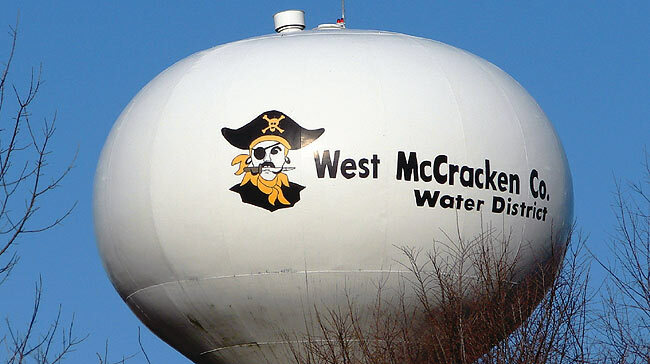 A pirate guards the West McCracken county, Kentucky, water tower. 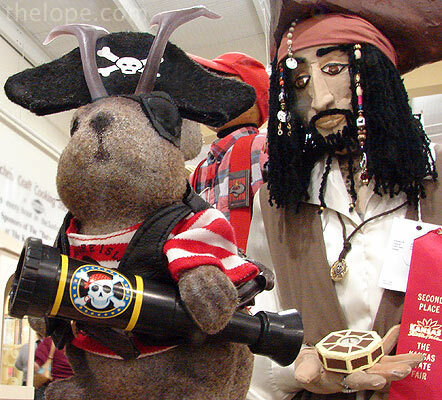 For the last few years, the Kansas State Fair has featured pirate scarecrows in its contest entries. 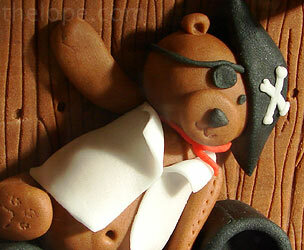 This year, perhaps due to the waning of the Disney pirates movies, no pirates appeared. 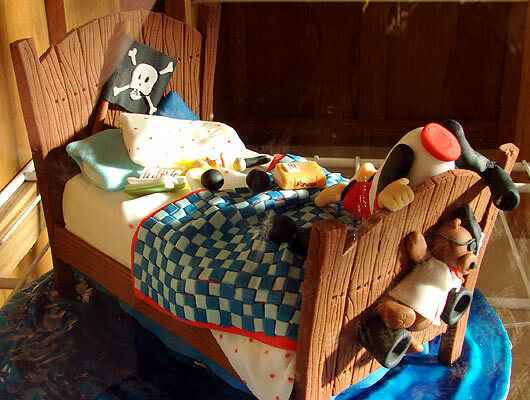 However, Brandi Bonilla of Reno County sailed to the rescue with her pirate ship/child's bed themed cake. I only noticed when I prepared the photo that the bed's inhabitant's head has come off. In an odd way, that kind of fits. 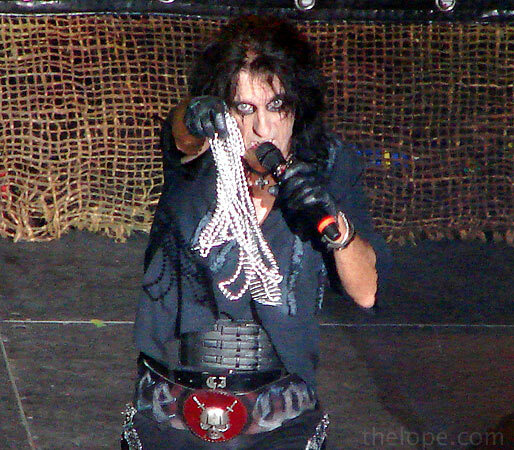 Alice Cooper offers a treasure of dirty diamonds to the state fair crowd while wearing what looks suspiciously like a pirate belt buckle. He also likes to play with a sword and wears a torn frilly shirt. Yep. Pirate.